The Energy Information Administration (EIA) reported total US petroleum stockpiles were the lowest since December 2018; this implies that the oil market is under-supplied. Brent crude hit $68 for the first time this year and settled at $67.16 per barrel by week closing. WTI rose to $58.52 per barrel. 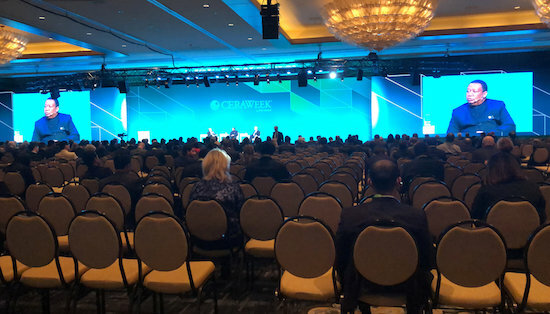 During CERAWeek 2019, the International Energy Agency (IEA) tried hard to capitalize on such an event to inject bearishness into the market when it appeared as a dedicated sales agency to the US shale oil producers. However, IEA efforts that were supposed to inject bearishness in the market have yielded bullish development as oil prices hit 2019 highs, and the highest level since mid-November 2018. The IEA published its inexplicable medium-term outlook, based on unjustifiable scenarios. US shale oil supply growth was the central inference in IEA’s medium-term outlook report “Oil 2019,” which was released last week and provides projections up to 2024. The IEA outlook on US shale oil made most of the media coverage concentrating on the theme of US oil supply dominance, painting a picture of an OPEC beleaguered by a tidal wave of US supply. The IEA report proved a huge mismatch in its outlook scenarios of the US growth, which did not consider oil price elasticity, and the price level required to support shale US oil growth. For instance, will the IEA change its outlook after 2020 if oil prices fall below $50 per barrel for Brent crude prices? Will shale oil output further thrive after 2020 as IEA figures suggested? Even if the US sets new records, these records need higher oil prices to maintain pace. The IEA also didn’t question US export ability, which is extensively constrained due to limited export facilities — and logistics that won’t be able to effectively accommodate such a supply surge from the US shale oil. Obviously, the supply growth outlook after 2020 in the IEA’s base case scenario is not likely to push OPEC into a deep state of despair. The prospect of US crude taking 18 percent of global demand growth is perhaps unlikely to upset OPEC; nor does it really merit the hyperbole of IEA’s outlook of the dominance of US supply growth in the medium-term. Earlier in the year, the IEA forecast US oil output at 12.4 million barrels per day (bpd) in 2019 only a month after the EIA forecast US oil output to average 12.1 million bpd in 2019. The IEA outlook continues to imply that shale output exceeds prior expectations. However, the EIA just downgraded its forecast for the first time in six months, in its latest Short-Term Energy Outlook that sees output average at 12.3 million bpd. It’s a rather minor downward revision, but the direction is important. Especially when the EIA puts December 2018 output at 11.85 million bpd, which means that most of the upward push to 2019 forecast has already taken place.